Joaquín Catalán Lapesa is the CEO of Thinks, Facts & Items, S.L., his own business related to communication and executive coaching based on the leitmotiv “The art of Communication inspiring human connections”. He is a Business Economist and Lawyer with 30 years of experience in various multinational and national organizations from health (Boehringer Ingelheim, Alere, SPD), industrial (Air Products) and professional services sectors, where he has garnered unrivaled expertise in project management, financial, commercial and human resources areas. Joaquin’s communication expertise includes advanced knowledge of communication tools and executive coaching, public speaking, media presenter and interviewer, negotiation and change management teacher. At his business, Joaquin is considered the strategist, creative manager and mediator of organizations´ communication processes. As a consultant or team leader, Joaquin cultivates a collaborative style of leadership using open and transparent communication. He successfully manages and inspires culturally diverse teams across geographies connecting people. He places a high focus on coaching and building a team, facilitating an environment that motivates staff and establishes productive cross-functional relationships. Joaquin’s varied background and experience provided him with the ample tools to start his own business in Switzerland, which has enjoyed incredible success. After receiving his Bachelor’s in Business Economy from the Universitat de Barcelona and his Bachelor’s in Law from University College Abat Oliba de Barcelona, Joaquin went on to receive his Master’s in General Management from IESE Business School and the one in Communication from Tracor Communication Arts Institute in Madrid. He is now finishing his international Law doctorate specialized in pharmaceutical distribution. A prolific writer, Joaquin has published various research articles, including: Collaborative Commerce, Internet Medicine Sales, and Distribucion Farmaceutica. Joaquin is a member of the Catalonian Economists College´s Academic Council with 20 years of teaching experience specialized in M&A and controlling. In addition to his work, Joaquin is a passionate humanitarian, and he and his wife, artist Elena Greandia, frequently donate time and resources toward Indian children in need, most recently through charity concerts. Joaquin resides in Messery, France and is fluent in various languages, including Spanish, Catalan, English, French and Italian. In his spare time, he enjoys remaining active by composing music, golfing, cycling and playing tennis. 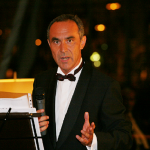 The International Society of Business Leaders Member Joaquín Catalán Lapesa can be found on the Society Directory, where he is looking forward to networking with you. Furthermore, you find Joaquín Catalán Lapesa on LinkedIn.